The 28th day of the session—like the 27 before it—didn’t produce a whole lot of official action, but it turned out to be one of the more busy days in Juneau: Rep. Gary Knopp caved, Sen. Shelley Hughes was saved from a potential indirect conflict of interest and we got some glancing information about what will be in Gov. Michael J. Dunleavy’s budget after the embargo on a bunch of paper-thin interviews was lifted. It turns out that candidate Mike Dunleavy and Gov. Michael J. Dunleavy still have quite a bit in common: Neither are particularly keen on talking specifics about his plans with the media. That was the takeaway form a series of interviews he gave with select media outlets to preview his budget. No hard numbers and it seemed like a chore for outlets to extract concessions that he plans to cut K-12 funding, University of Alaska funding and take a swipe at undoing Medicaid expansion. Every one of those will be a fight, but it looks like Alaska’s health care system came loaded for bear. The Alaska State Hospital and Nursing Home Association released a report last week examining the economic impact of eliminating Medicaid expansion and its conclusion is scathing. That’s because a vast portion of Medicaid Expansion enrollee expenses is covered by the federal government: It’s currently 93 percent and ratchets down to 90 percent in perpetuity in 2020. Because groups look at the ripple effect of spending, the group’s analysis would estimate that the complete removal of Medicaid Expansion would take $420 million of government spending out of the economy resulting in job losses totaling 4,000 jobs with a hit of $627 million to the economy. It assumes, however, that some people will go get private coverage and reduce the economic impact to 3,700 lost jobs and an economic hit totaling $556 million. The economic hits would be felt most by hospitals but would be expected to trickle out to other industries like air travel and restaurants. Arduin hasn’t been able to answer legislator questions about the impact of the proposed cuts or whether schools have the money in the bank to handle it or a slew of other basic questions about pulling $20 million out of the in-progress school year. 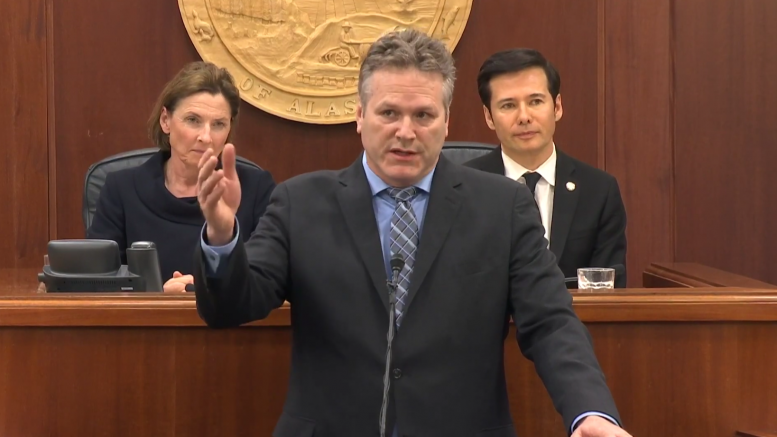 Dunleavy opposed Medicaid expansion back in 2015 when Gov. Bill Walker went around the Legislature to accept the additional funding. At the same time, Americans for Prosperity showed up in the Alaska to go to battle with Medicaid expansion. Medicaid Expansion is, of course, part of the Affordable Care Act, making it one of the biggest political targets for Republicans, and it also happens to be a key funding piece of criminal rehabilitation efforts. Republicans in the Utah Legislature on Monday partially blocked the voter-approved Medicaid expansion initiative. Democratic legislators are setting up the defensive lines on Medicaid expansion, releasing a legal memo this morning that argues the governor can’t unilaterally undo expansion without a change in law. We’ve heard a lot about the timeline of events that ended Monday with Rep. Gary Knopp caving and coming back to the 21-member Republican majority. The timing was shocking to many in the capital as a it appeared a bipartisan coalition was on its way to organizing on Monday afternoon. It’s unclear whether Knopp fully understood these plans or not, but at least two sources close to the subject say they believe he was aware of the proposal—which would have had a coalition of 16 Democrats, seven Republicans and one independent—before he decided that the destined-to-fail 21-member majority had his support. It also just so happens that Republicans in his district were meeting Monday night to decide whether or not to ask him to resign. Even though they met after the news of his capitulation, they still voted 10-9 to give him the boot. Still, it doesn’t sound like that this is the end of the plan and there could still be hijinks before we have a majority in place. If it’s really the same 21-member Republican majority that was announced the day after the election, then the whole month of impasse was for pretty much nothing. At least a 21-member, every-member-holds-a-veto majority ought to be entertaining. 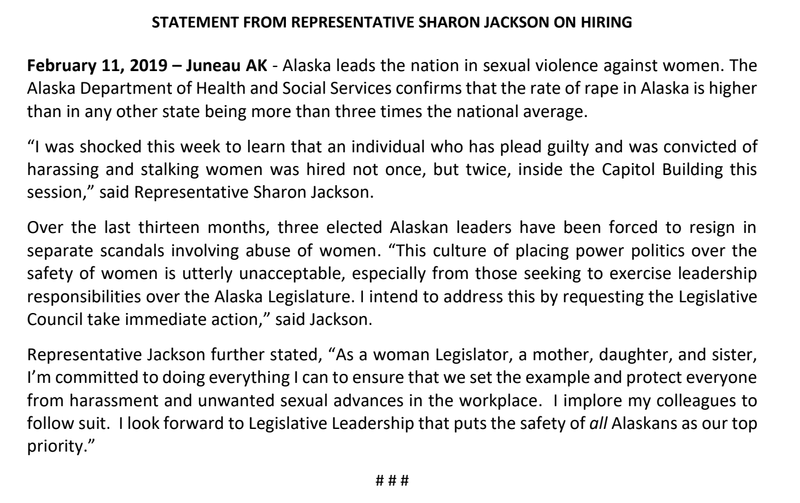 Rep. Sharon Jackson, R-Eagle River, released a statement on Monday alluding to the hiring of convicted stalker Peter Paul Ferrero in the Legislature, an action that was first reported by the Alaska Landmine. While some have defended the hiring as a redemption and a “he paid his price” sort of thing, Jackson explains why it’s problematic given the backdrop of everything in the Alaska Legislature. Today, Feb. 12, happens to be one year since Rep. Zach Fansler finally resigned. Sen. Shelley Hughes, R-Palmer, really wants everyone to know just how bad the Legislture’s new ethics rules are. After ceasing visits to her doctor and pulling a health care bill because her husband is a physician, Hughes has washed her hands of criminal justice reform rollback Senate Bill 32. She says because her husband occasionally might treat people who are receiving substance abuse treatment through criminal justice reform, she couldn’t take any action whatsoever on the bill. That included taking amendments, preparing a committee substitute, having private discussions with anyone or even posting documents online. Is it a legitimate reaction or an overreaction that will allow legislators to open up broad changes to the state’s ethics laws? Who knows, but the Senate allowed her committee to hand the bill off to the Senate State Affairs Committee on Monday. There was a lot of good, compelling testimony from teachers, students and school administrators at the Senate’s public hearing Monday. What was particularly interesting, however, was hearing Sen. Mia Costello quizzing one group about class sizes, percentage of funds going to administrators and fund balances. She seemed surprised to hear that not all school districts would be able to happily weather $20 million being yanked out mid-year. Oh, it turns out that the Office of Management and Budget and school districts aren’t entirely aligned on the impacts of mid-year cuts? Surprising! 3 Comments on "AKLEG Day 28: Eliminating Medicaid expansion would save state $30 million, cost economy $556 million"
You should tell people about how Medicaid Expansion was mostly for young, able-to-work adults. While there is never a need for welfare, this is certainly one of the worst cases. You know most of us work multiple part-time jobs, or season and temporary work that doesn’t cover health care? The number of jobs with benefits is not what it used to be.